One of the many joys of being sufficiently competent in the kitchen is the ability to recreate dishes from taste memory. A couple of weekends ago I bought an assortment of salads from Whole Foods’ take out counter and really enjoyed them. They were pricey for what they were but the convenience factor was hard to beat. As I sat in my hotel room shovelling bites of delicious salad in my mouth, I thought “wow I have to make this once I get home”. Of course the urgency waned off once I was surrounded by the comfort of my own kitchen. It took another road trip and a visit to a Whole Foods 900km from home before I actually did anything about this inspiration. 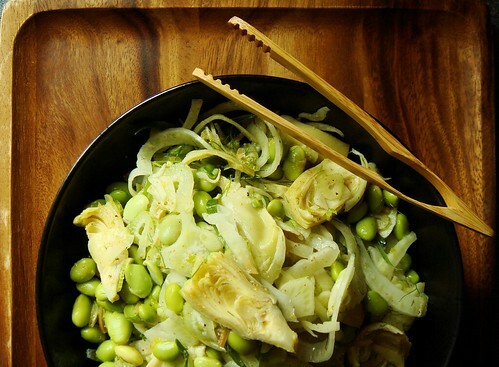 This Fennel Artichoke Edamame Salad tastes refreshing even on hot summer days. Don’t be fool though, the ingredients are easily available year round so you can enjoy it any time of year. I seriously love using slow cooker in summer. After the success of healthy beef stew, my love for slow cooker was renewed and I went through Slow Cooker Revolution Volume 2 searching for recipes to try. As luck would have it, my cravings for chicken wings coincided with the weekly sale at grocery store next door. I bought 4lb of wings with no hesitation. Unlike the original Slow Cooker Revolution, America’s Test Kitchen placed a strong emphasis on easy prep in volume 2. A majority of recipes get a bit of help from premade sauces and ready-to-use ingredients. Normally I am not a big fan of such shortcuts but I make exceptions. Sriracha and hoisin sauce are two Asian cooking pantry staples that I happily buy from stores. 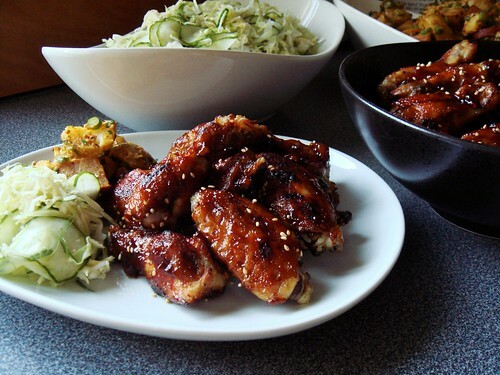 Coincidentally, they are key to success of slow cooker Asian-Glazed Wings (recipe is available on Eatocracy). Last weekend I took part in the Roller Sports Canada National Championship in the Masters Women category. My performance was within my expectation and it was a nice change to get back in the rhythm of racing once more. My speed is not back yet but race photos provide solid evidence that I made improvement with my form. I skated well in the distance races (5km and 10km points) leveraging my race experience and endurance training. My coach prepared me well to handle those conditions with gruelling training program that I dreaded. An old friend came over to me after my 10km points race to welcome me back to the racing scene. He said he thought I would not be fit after such a long break but I proved him wrong. I guess I owe my coach a big thank you. The unique challenge about nationals is that we all hang out at the track all day long for the whole weekend. There are lots of down time in between races but I need conserve energy. Racing in blazing heat under the relentless sun quickly zaps energy out of anyone. Last weekend I sat under the shade as much as possible and stayed hydrated. I also packed myself a bento with breakfast and lunch to fuel me throughout the day. Heating up the kitchen is a great deterrent for summer cooking. It is no wonder grilling has enduring appeal when the temperature gets warm. For reasons unknown, I do not own a grill nor am I motivated to get one. I do not like the idea of heating up the kitchen either and it inspires me to turn to dishes requiring little to no cooking. It doesn’t hurt that such dishes tend to be easy to make to take advantage of vibrant summer flavours. I took at a look at my calendar and realized that I skipped out on making weekend family dinner for almost a month. That is highly unusual and I feel a tinge of guilt to deprive Little Brother of wholesome home cooked meals. I am struggling to get back on my feet. Even though it is small progress, preparing family dinner last Sunday is a clear sign of improvement. It is nothing fancy but I am gradually taking joy in the simple task of cooking once more. 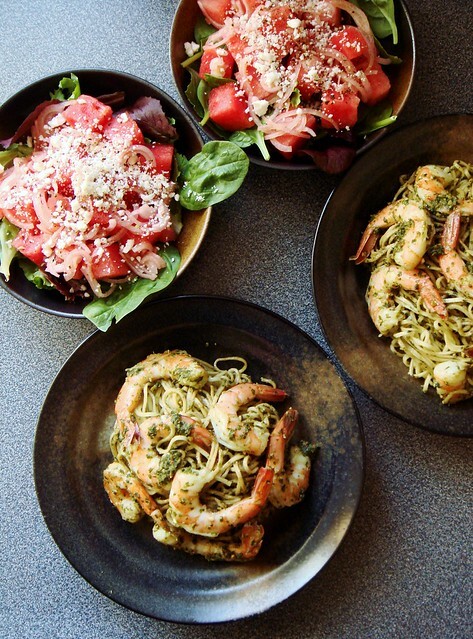 With less than five minutes of heating, I prepared a meal of watermelon feta salad on mixed greens with pickled shallots and pesto angel hair pasta with prawns. 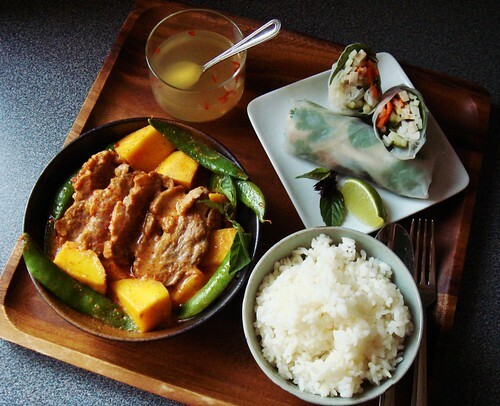 It is a menu requiring little work yet delivering big flavours. I barely did any cooking since my last post. As I alluded, I do not want this hobby to become a chore. I try to be kind to myself. When I simply don’t feel like cooking, I do not put pressure on myself to make something just to have something to write about. With less demand in the kitchen, I found surprising amount of free time and surplus budget on my hands. I never think about how much time and money I devote to my hobby but it certainly makes a lot of sense. Last night I finally ran out of ready-to-eat food so I had little choice but to put something together for dinner. I scrounged around and gathered bunch of ingredients together. A can of hot smoked coho salmon. A box of washed kale. A handful of baby carrots. A bunch of really fresh basil. Some romaine lettuce leaves. Toasted peanuts. I chopped and sliced and tossed. 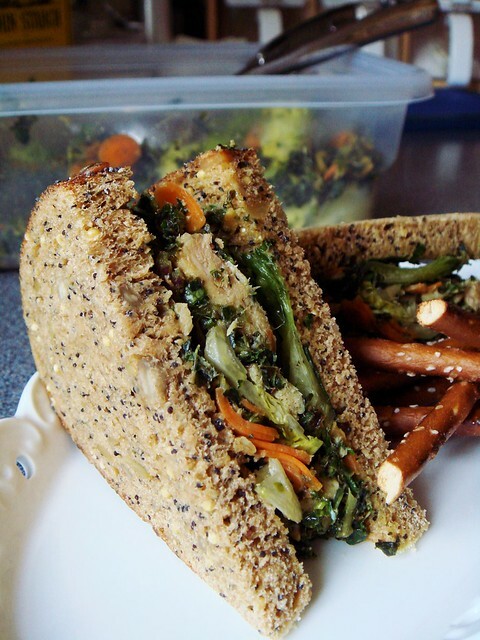 15 minutes later, I had a box of sandwich filling made special with an Asian-inspired peanut dressing. 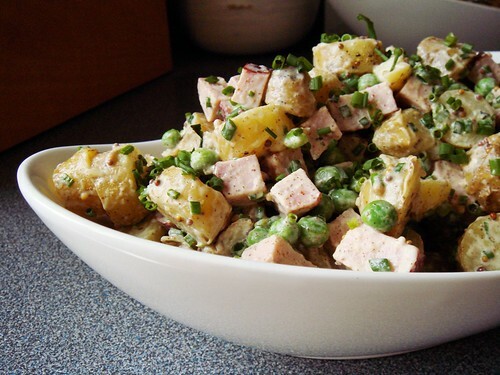 Main course salad is a mainstay of my diet especially on warmer days. It was more than a little disappointing that in just one week we enjoyed mild days of 20C before plummeted back to below freezing with added snow. It felt like adding insult to injury after the harsh winter we endured. No matter. I had my heart set on spring and I made it happen on my dinner plate. Lucky for me, I was in no shortage of great ingredients that evoke memories of sultry evenings. Last Friday I went to Whole Foods with much anticipation. It was their annual one day sale on champagne mangoes. $9 for a case of 16 large juicy mangoes! 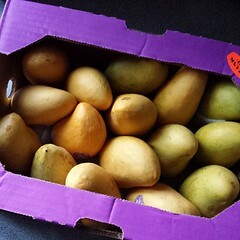 I bought a case with a mix of both ripe and under-ripe ones, some for eating out of hand and others for green mango salad. An abundance of tropical fruit in April felt like an affordable luxury. 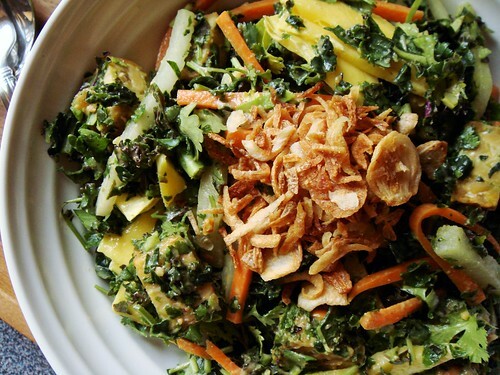 I created a kale green mango salad with toasted tempeh for dinner earlier this week. Without the smidgen of fish sauce I added to the peanut lime dressing, this is a vegan main source salad high on flavour and dense in nutrients. Did I also mention it was made in 15 minutes flat? When the temperature climbs, I turn to lighter dishes. While my dinner can lighten up, I wish I can do the same with my mood. This week I’m finally making real progress on clearing those pesky concussion symptoms. Feeling “normal” is very much underrated until you can no longer take it for granted. One thing that I learned from previous concussion recoveries is that getting upset, especially crying, is horrible for healing. Unfortunately, a common symptom for concussion is depression. Put the two together and you can see the vicious cycle that feeds itself. As luck would have it, similar to my experience in 2012, I once again have to deal with break up and concussion recovery at the same time. I spend a ridiculous amount of time trying to detach myself from emotions even though I have endless amount of tears to shed. It’s almost a comical situation if I am not so sad about it all. Without training nor a significant other, I have a lot of free time on weekends. I keep myself occupied with boring repetitive tasks in the kitchen. Last Saturday, I spent hours cutting up huge amounts of green papaya, cucumbers, carrots, daikons, and Vietnamese sausage into skinny matchsticks. They are the building blocks for summer rolls and green papaya salad. Exactly how much cutting and chopping did I do? Well, I had enough rolls and salads for 6 dinners. Ridiculous. No wonder my hand was sore from holding the knife for so long. Let’s take a break from caramel and chocolate for something more earnest. As much as my name would suggest otherwise, I cannot live on candies alone. I had an extraordinarily relaxing weekend and back on my low cognitive stimulation rest regiment. It is a setback but such is the nature of recovery, I suppose. Exercising is temporarily out of the question so I take this opportunity to tackle some cooking projects. Nothing terribly challenging but time-consuming tasks were much welcomed. I wanted to keep my hands busy and my head empty. Two light yet comforting family dinners were the outcome of my weekend mandate. I have little love for making pie dough, much less by hand. Yet, without any looming deadline, it seemed like an appropriate way to spend the time on Saturday…especially knowing that my effort went towards a flakey Zucchini Ricotta Galette (recipe online at smitten kitchen). It had been a while since I last enjoyed any savoury galettes at home and I looked forward to reacquainting myself. 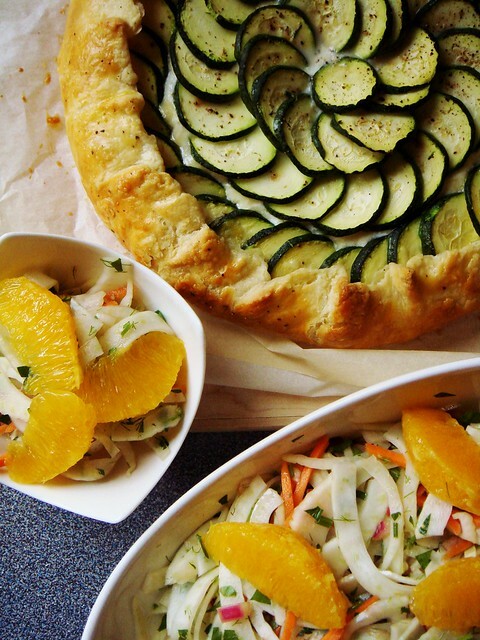 Sunday family dinner can be inspiring as a successful result of pantry diving. Lately I am not motivated to tackle any complicated cooking projects even for the weekends. When Sunday 5pm rolls around, I panic a little trying to figure out what to serve. Luckily I found a new staple that bailed me out of trouble the last few weeks: prewashed chopped rainbow kale! The clamshell box looks similar to most salad greens but it offers so much more. You don’t need me to extol the nutritious virtue of kale. What I can tell you is its versatility. Eaten straight out of the box, I can’t say I’m a fan. The pieces are too large, too unwieldy for a fork. Mature kale doesn’t have the tenderness of most salad greens I’m used to. Munching on them makes me feel like a grazing cow. The magic happens once I shred them into tiny pieces with my trusty food processor. The shredded dark green leaves hold up well in the fridge even after tossed with salad dressing. In fact, they wilt just enough to be flavourful and easier on the teeth. Similar to cooked grains, they add so much bulk to whatever salad I make too. But unlike grains, shredded kale contribute mega vitamins without mega calories. There is so much to love. For the first time since I started writing at Dessert By Candy, I have a whole week of recipes lined up. I did not spend the whole weekend slaving away in the kitchen. Quite the contrary, in fact. 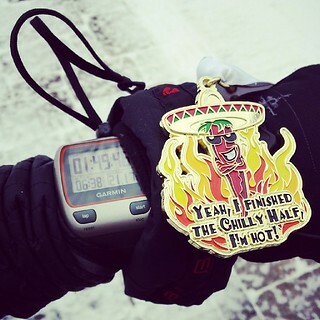 With a water heater repair appointment on Saturday and racing the Chilly Half Marathon on Sunday, I did my best to avoid the kitchen all weekend. Hot water is now flowing from the tap and I notched another sub-1:50 running race in my belt. Can’t say I am dissatisfied with my weekend activities. 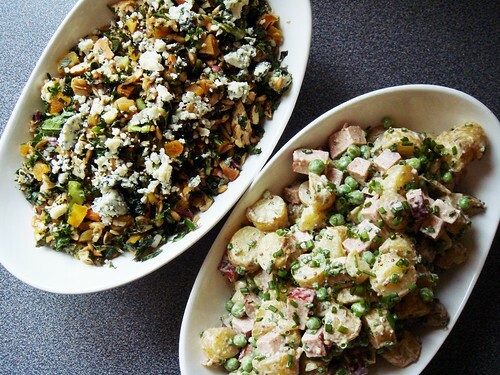 On Saturday, I quickly prepared a couple of substantial salads for weekend dinners. I wanted nourishing food for pre-race and post-race dinner. 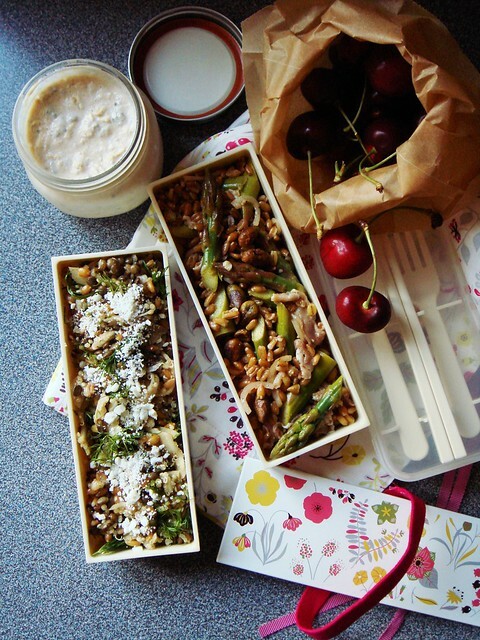 The salads must hold well in the fridge over the weekend. I cannot think of easier alternatives. Seriously, putting dinner on the table took less than one minute. Take salads out of fridge. Set bowls and cutleries on table. Eat.